According to Rovio CEO Mikael Hed, Angry Birds Space will be heading to Windows Phone marking a complete turn around by the company after it was reported that Rovio had no plans to make the port. Speaking to Reuters the CEO dispelled rumours that the game would only be arriving on iOS and Android smartphones. The game which was officially released yesterday is the latest addition to its bird flinging mega app franchise with the Angry Birds Space app launching for iPhone, iPad, Android, Mac and PC. Having made the announcement earlier this month from the International Space Station with the assistance of NASA, Rovio formally outed the all new follow on to the globally dominant app sensation with Angry Birds Space playing host to new gameplay styles and a selection of new miffed avian protagonists. Originally teased late last month, the new Angry Birds offering follows on from the original Angry Birds title, spin-off Angry Birds Seasons and movie tie-in Angry Birds Rio with the latest offering featuring 60 interplanetary levels from launch with more to follow. With more than 700 million all platform downloads of the three existing Angry Birds titles, the new release will help Rovio edge towards the unparalleled one billion downloads milestone with the original announcement coming just days after the gaming phenomenon hit the world's largest social network, Facebook. Claiming to promote learning and physics through play, the new Angry Birds offering sees gamers battling against variable gravity environments in order to deter the familiar band of pesky pigs from stealing the birds' eggs. “By taking the game galactic, Angry Birds Space retains the familiar elements of Angry Birds gameplay but gives them a unique twist in a variable gravity environment,” an official Rovio spokesperson said of the new title. Having already confirmed today's March 22nd Angry Birds Space release date, developer Rovio recently confirmed that it would make the new addition to the ever popular app sensation on a broad range of platforms and operating systems from launch. 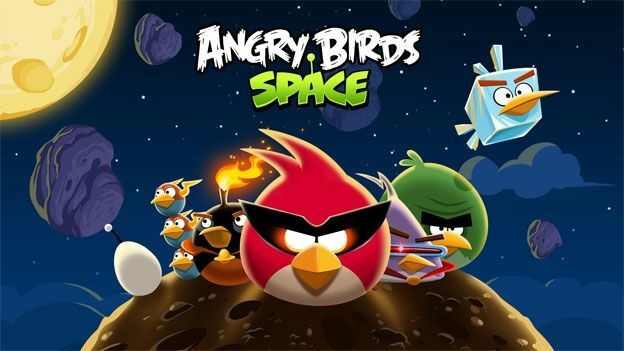 Despite concerns that Rovio had signed up to launch Angry Birds Space with a period of exclusivity for the Android powered Samsung Galaxy Note, the Finnish developer revealed that the new app would launch simultaneously on iOS, Android, Mac and PC. With 60 levels available at launch new stages of space exploration will be released via free regular updates as well as a selection of upcoming in-app purchases. An Angry Birds Space Windows Phone 7 offering has still yet to be confirmed. Are you impressed with the latest development to the Angry Birds franchise? Will you be downloading Angry Birds Space on March 22nd? Let us know via the T3 Twitter and Facebook feeds.